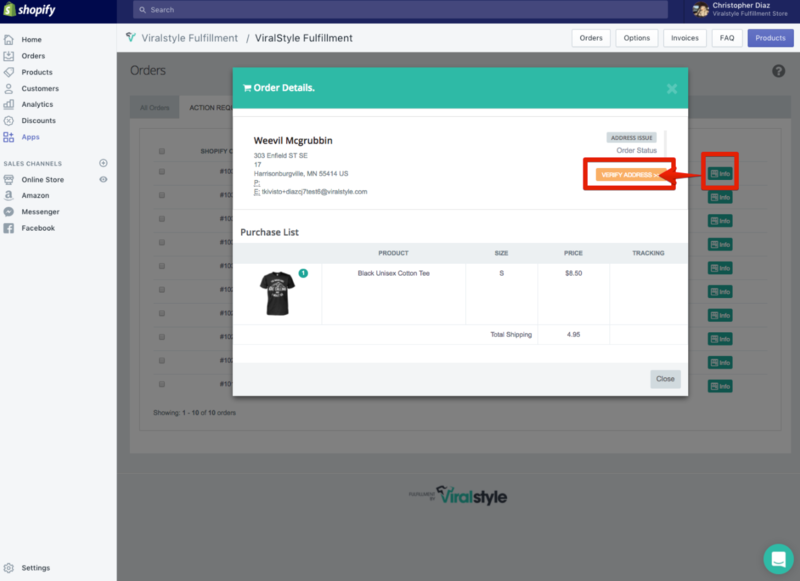 Viralstyle Fulfillment will add an order to the "Action Required" tab to advise Merchants that manual action will be needed to proceed. This means that the order will not move successfully into the Production queue until the matter is resolved. You will not be billing for Production & Shipping costs until the order has been processed. When clicking the info tab to the right of the order in question, you will see the “verify address” tool. This tool will pull the address from your Shopify order page, automatically adding the information to our 3rd party verification app “SmartyStreets”. This app is used to verify Domestic shipments (USPS). We have made it quick & easy to verify the address by showing you which fields are invalid. This will help you identify the issue so you can reach out to your customer and request an update (or alternate address) to proceed. After you have verified the address using the 3rd party verification system, simply copy/paste the verified address back into the Shopify order page (shipping address “edit” field). The update will automatically push through the API, updating the order information on our side. Keep in mind, once you have updated the address(es) we will change the order status to "Payment Issue". This is to inform you that we have not yet approved/verified the address, therefore have not charged you. Once we have approved/verified the address & charged your verified payment method, the status will immediately change, and the order will move back into the "All Orders" tab. This will confirm that we have accepted the new/updated address & will continue with production immediately. This process is automated, you should not need to take any further action if the new address/information is valid.